Shop this sale and the kids will be dressed to impress for Easter! 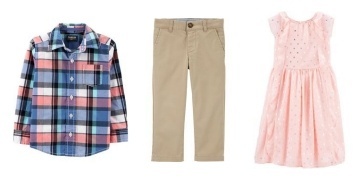 Easter dress up styles are 60% off at Children's Place and guess what? There are absolutely no exceptions! Use this sale to grab that one piece of an outfit you're missing (say a shirt or vest) or create a whole ensemble. Because it's not just clothes; shoes, tights and accessories are all marked down as well. I'll warn you, it may be hard to narrow down your choices here, there are just so many great options to choose between. But with these prices, you can probably grab a few extra items and find reasons to wear them all! Be sure to place your order by 11:59pm EST on April 10, 2019 for guaranteed delivery by Easter. Children's Place offers free shipping within Canada.